Now with a claimed top speed of 306km/h, the Bentley Bentayga Speed claims the 'World's Fastest SUV' title as it pips the 305km/h Lamborghini Urus by a whisker. If some people found the already-manic Bentayga W12 short on power and speed, its good news for them as Bentley has brought the Bentayga under its 'Speed' range of models and has thus created the Bentayga Speed - the world's fastest production SUV. While the standard Bentayga W12 produces 600bhp and 900Nm of torque, the Bentayga Speed's power output has been bumped to 626bhp. This means that the 0-100km/h time has come down from 4.1 seconds to 3.9 seconds and the top speed has gone up by 5km/h to 306km/h! However, all this has been achieved just by re-tuning the existing twin-turbocharged 6.0-litre W12 motor. To make the overall response of the Bentayga crisper, the Sport mode has been recalibrated to enhance response from the W12 engine and the eight-speed automatic transmission, as well as the suspension and Bentley Dynamic Ride. The effect is a more dynamic and engaging drive. 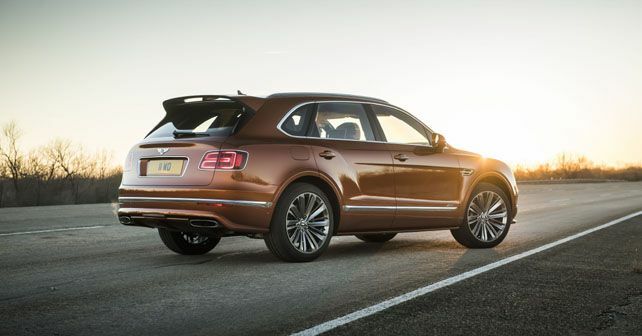 To differentiate the Speed from the standard Bentayga, Bentley has incorporated some exterior styling changes in the form of tinted headlamps, body-coloured side skirts and a tailgate spoiler. Further exclusivity has been achieved with the help of tinted radiator and bumper grilles, a bespoke 22-inch alloy wheel design (available in three finishes) and 'Speed' badging. The interior too has been subjected to minor upgrades like new contrast stitching, 'Speed' badging, an illuminated 'Speed' treadplate and Alcantara upholstery (a first for the Bentayga). As the car is made to order, Bentley has also taken this opportunity to introduce some more optional extras to the Bentayga line-up with carbon-ceramic brakes, 22-way adjustable front seats and mood lighting making their way to the list of optional extras. Bentley began its long tradition of building 'Speed' models back in 2007, with the Continental GT being the first model to receive the Speed treatment. Prior to the unveiling of Bentayga Speed, the Bentayga had already claimed the SUV record at the Pikes Peak International Hill Climb in 2018. While the Bentayga Speed will be making its debut at the upcoming 2019 Geneva Motor Show, we are yet to receive a confirmation of whether any units of the Bentayga Speed will make it to India. Currently, the Bentayga is available in India with either the W12 or the V8 engine option.